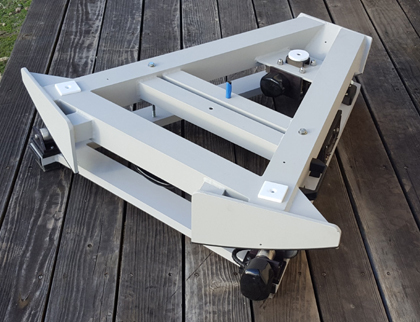 For someone with a large scope and a higher latitude, we have a beautiful Dual-axis Aluminum Platform. It is used but in excellent (almost new) condition. It was built for use with both a 25" Obsession and a 30" Obsession. So it can easily carry either of those two scopes or something similar. Comes with a corded hand control that gives you a two-speed slew in both RA and DEC. A cordless hand control is an option, along with a built-in battery and a Polar Alignment Tool. This Platform was designed for a nominal latitude of 45 degrees, but will work perfectly a couple degrees on either side of that. Original price new was $4250. It is available now for $2600, plus crating/shipping. 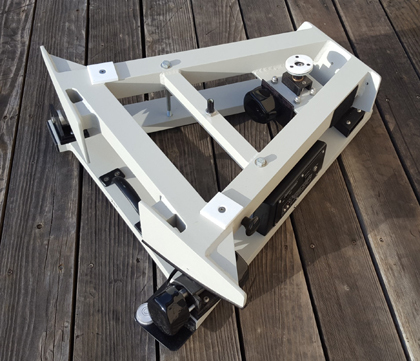 Aluminum Dual-axis Platform for a 15-18" dob. Will also fit something like a 12" Orion dob. Latitude is fairly low at 24.4 degrees. Could be used from 27 degrees down to about 21 degrees. So southern Florida (Miami area or in the Keys) or southern Texas would be a good fit. In like new condition. Comes with a corded hand control. Options would be a cordless hand control, built-in battery and Polar Alignment Tool. New price would be $2625. This Platform is priced at $1800 plus crating/shipping. If you have questions, email us at tomosy@nccn.net or call at 530-274-9113.